As populations increase, so does the number of cars and roads. People also demand more comfort and speed, resulting in road developments increasing more rapidly than population. People need houses, shops, offices and factories. All this development requires frequent cutting of the earth, resulting in increasingly severe erosion. Fortunately, substantial gains can be made to reduce erosion. Understand how roading and development have become major contributors to land loss and erosion, pollution of waterways and coastal seas. Discover how to prevent or minimise erosion from landscaping, urban development and roading. How to stabilise banks and how to compensate for ecological changes. 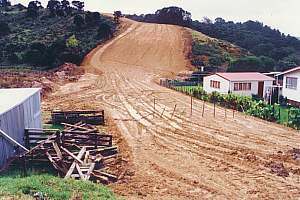 Roading and land development contribute largely to the amount of mud reaching the sea. As the world population increases, so do the number of cars and houses and also the number of road works and development sites. It is an accelerating process. Road construction is a high level engineering job which includes the building of bridges and tunnels. Some understanding of low level engineering is necessary for this chapter: cut-and-fill, slope, strata, drains and more. The killer kerb: a little-known fact kills innocent people every day. It is time to stop this carnage. Roads are the most lethal environments thinkable, leaving their marks on the natural environment. How can this be ameliorated? 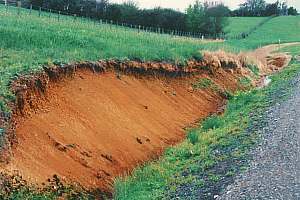 Where soil is cut or laid bare, erosion becomes a major problem. Several solutions have been tried. Stabilising road-side cuts or banks, is a major problem that needs new solutions urgently. 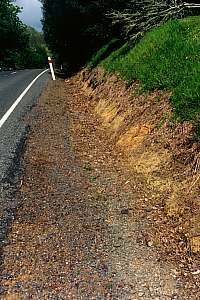 The roadside banks are maintained by scraping, cutting and spraying, each causing its own problems. An environmentally friendly approach is long overdue. Roadsides can be beautiful. In many places, people have taken stewardship of a section of road to plant it with pleasing vegetation. You can play a role in reducing erosion with its devastating down-stream effects. Ever since humans have been roaming the Earth, tracks and roads have been made and maintained to facilitate travelling. First there were foot tracks, for humans only (humans are one of the very few species able to walk, swim and climb a tree. Tigers do so too.). These tracks were later widened and smoothed for pack animals, and later again for draught animals and their carts. Then came the automobile which required better roads, but progress did not stop here. The world is continuously upgrading its roads to accommodate more vehicles, heavier vehicles and more connections. At the same time roads are altered to accommodate higher speeds and improved safety. As societies became more affluent, an increasing sum of money was spent on roading. At the same time, gains in mechanisation have made the process more incisive, resulting in roads becoming a major factor in soil erosion. In this chapter we'll examine the effects that roading has on the loss of land, and its continually increasing contribution of mud to our oceans. Please note that no scientific publications could be found on this matter, which makes this chapter rely heavily on my own observations over a period of twenty years in New Zealand. The many photographs illustrate the issues. Modern urban development demands the 'landscaping' of the soil, requiring the cutting and shifting of large quantities of it. During the entire time it takes to do the cutting and filling and spreading of topsoil, the whole developed area is left bare and extremely sensitive to erosion by rain storms. 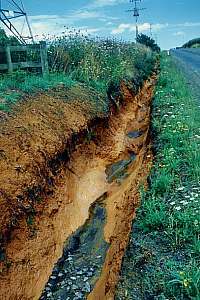 The shifted soils are easily saturated by rains, resulting in high levels of runoff. 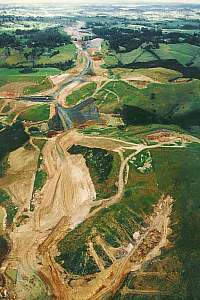 In an aerial view of a new motorway between Auckland and Orewa in New Zealand, one can see how much of the land has been slashed bare, causing massive flows of mud to the sea. The process never stops or abates because society progresses and the expensive machines must be kept working. This property access road was delayed because of heavy rains, which left the soil bare for many months. Such 'Acts of God' cannot entirely be foreseen, but it illustrates the dimension of the risks. The same road as in the picture on left, took two years to be sufficiently grassed to diminish soil erosion. For two years it was a major contributor of mud to the local estuary. Even now its sides are not completely covered. Although this is not the place for a course in civil engineering, it is nonetheless helpful to understand a few engineering issues. This diagram shows three roads cut in a hill with sloping rock layers. Roads need a horizontal cross-section, wide enough for its purpose. 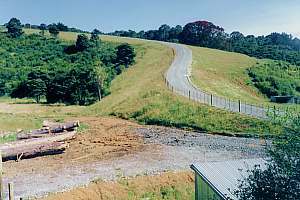 Engineers cut into the hill and use the fill to level the down-hill side of the cut. 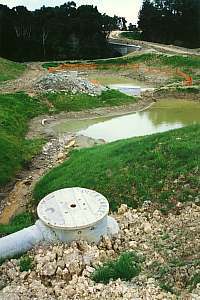 Fill is often transported several hundred metres to fill gullies. The easiest places to cut roads is on the crests of hills. Here the soil is nearly level, requiring very little cutting and filling. Besides, the soil is dry, which hardens the road. 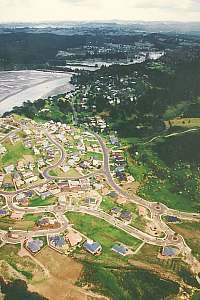 Most connecting roads run over hill crests. 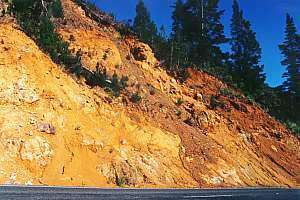 On the left, a road is cut through the down-sloping rock strata. 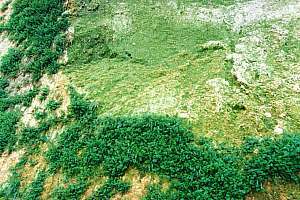 When rock layers slope down, soil slumps are hard to contain because water (blue arrow) seeps under the soil and over the rock, lubricating it. Gravity makes it slip onto the road. To remedy this problem, requires draining the soil, cutting terraces and planting trees. In a case like this, the roadside bank is easy to revegetate because of the availability of moisture. On the right-hand side of the hill another road has been cut. Because the rock strata slope backward, its banks are stable. If the hill side is capped with trees, enough moisture will be provided to revegetate the bank. Whether a bank faces the sun or is turned away from it, matters enormously to the amount of available moisture, and consequently to how to revegetate it and with which species. In the diagram a profile of a cut road is shown. Wherever a cut is made, the water table drops down, as shown in the profile. 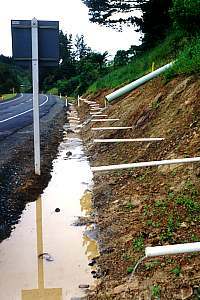 The uphill ditch serves not only to drain water during rain storms, but often also to lower the water table to keep the body of the road dry. If the water table is too high, the road becomes soft, no longer able to carry heavy loads during the wet season (top left picture). The diagram also shows green vegetation willing to grow where it can reach the water table, on top of the bank, around the ditch and below the road. The upper part of the bank is usually too dry, resulting in bare soil, exposed to raindrop impact erosion. It can now also be seen that by rounding the cut (dotted line), the cut profile can be made to follow the water table more closely, which makes revegetating the bank easier to do. It is a simple and cheap measure to reduce bank erosion considerably. An example of poor engineering and politics. The Goat Island Road needed to be tar-sealed, but in order to attract a government subsidy, it had to be made much wider than strictly needed, resulting in steep road cuts intruding on neighbouring farmland. To make matters worse, the cuts were not rounded and no form of erosion control was applied. All this soil ended up in NZ's first marine reserve, damaging the marine environment considerably. 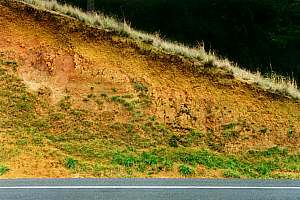 A bank bordering a motorway, shows how difficult it is to control erosion by revegetation. When unattended, this bank will creep backward like it has been doing for at least six years. Every year, this scar alone delivers at least two ton of mud to the sea, about 200x the rate of natural erosion or 50x that of the grassed soil above it. The problem here arises not from scouring or gullying but from the deep volcanic soil crumbling away faster than seedlings can grow. Also the water table is out of reach. 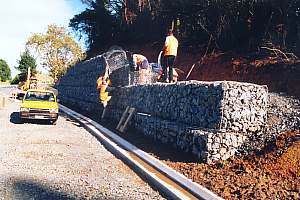 Wire netting baskets filled with stones are called gabions. Here they are stacked to protect an unstable bank. It is an expensive method, and what will happen when the baskets rust through?. These landscaping machines have not been bought to stand idle. 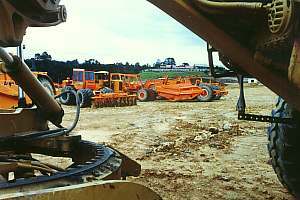 Modern machinery has enabled humans to shift more soil in a shorter time. From this perspective, they are both a blessing and a curse. This tall bank was easier cut than contained. Banks like these should have been terraced and replanted in deep rooting trees. Now it has become a problem too hard to tackle. Erosion denudes the rock face and all soil ends up in the sea. Drains and ditches are often not part of the engineering side of road design, but they should. Inadequately designed drains and ditches cause much erosion. One of the problems is that a permanent solution, such as a concreted waterway, is often unaffordable, and it sits in the way of further widening or straightening of the road. Usually the roading process is one of gradual improvement, requiring many successive events of cutting and grading of the road's cross-section. The road's shoulders and ditches are frequently shifted over time. They should transport all the water from banks, road surface and often adjoining property, without flooding the road. Adequate drains are required to cross under the road. Downhill farm land should not carry the burden of concentrated water spouts running over its pastures or cropland. Ditches should be paved with a natural substance which costs little, is easy to shift, and does not impede water flow, while being easy and cheap to maintain. 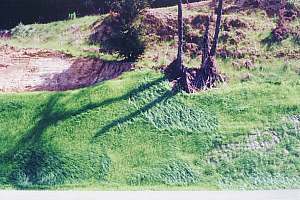 Grass can successfully be used to pave ditches, requiring specially designed mowers, but a single application of herbicide may negate all the effort of establishing it. 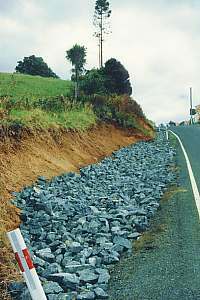 Where water runs fast, ditches should be paved with stones and check-dams to slow the water down. An example of how a poorly designed ditch has eroded almost beyond salvation. In the process, the road has also become more dangerous. This ditch is now about 1.5m deep. How can it be repaired? Another example of a poorly designed ditch that was scoured out to 1m depth, and in the process took most of the bank with it as well. Now an expensive bed of rocks was needed to repair a design fault that could have been avoided. The roadside ditch has been paved with coarse gravel, and check dams made of sand bags have been placed to slow the flow. The sand in these bags may have been mixed with a small amount of cement, to make them last longer. It is a cost-effective solution. This soil rests on a down-sloping bedrock, reason why it is being drained. Without the drains, a slip would be very likely. Notice how much water drains from this bank. The whole idea of check dams is to change the direction of the rushing water such that it works against itself. The most effective way is to send the water up in the air like a spout such that its forward speed is lost. Check dams must not bank up water, but always leave a small opening for small flows. They are needed most for the rare occasions of torrential rainfall and should be dimensioned for these events. Sometimes little details matter. How often do you read in the newspaper of pedestrians being hit by cars; of cars hitting lamp posts placed well free of the road? This is caused by the unknown and invisible terror of the killer kerb. It is everywhere and it kills innocent people, while blaming or even jailing other innocent ones. I've driven some 2 million kilometre and seen only four accidents happen before my eyes. Three of these were caused by the killer kerb. Fortunately, both ended only with material damage. In one I just escaped by luck. Here is what happens. 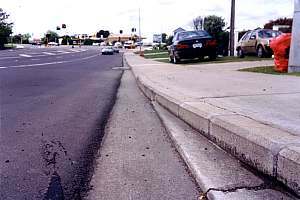 The killer kerb is the abrupt boundary between the raised side walk and the road. Sidewalks are raised for the pedestrian's safety and also to keep it high and dry, above the rainwater runoff from the road. The water runs against the kerb until it encounters a storm water drain. When a rubber tyre grazes this vertical kerb, it causes enough friction to slow the wheel down, but the car pushes forward and turns the wheel slightly, resulting in the wheel being pushed firmer against the kerb, causing more friction and more slowing down. Very suddenly the wheel is almost stopped. The steering wheel jerks out of the driver's hands with tremendous force and the car jumps onto the kerb, into innocent children or a lamp post (figure A on left). On motorways with median barriers or side barriers, the car turns almost entirely around, facing the other direction, and is bounced off the barrier into the opposing traffic, traversing two lanes and the median strip, causing mayhem (figure B). Killer kerb accidents happen in a moment of inattention, a misjudgement of where the wheels on the other side of the car are, sometimes by slight drunkenness and an unsteady course, sometime carelessness. So many innocent drivers are sued for an accident that they could neither foresee nor avoid. It is particularly acute on bridges. Drivers say that 'they suddenly lost control' and 'the car changed direction suddenly'. Figure C shows how a slightly turning wheel rubs increasingly more against the sharp kerb. Kerbs can be made safe by following a profile somewhat like the blue dotted line. In figure D some of the kerb profiles in use are shown. The bottom one creates more depth for the water to flow, but at the same time becomes the worst killer kerb in use today. The profiles above it are progressively safer. 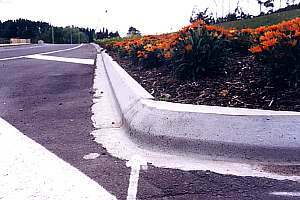 It is true that modern kerbs are more gentle, but the killer kerb is still actively laid today, everywhere in the world. No research has been conducted into how a kerb should be shaped to be safe, nudging a car safely back onto the road. The killer kerb has a large effect on small wheels, much less on buses and trucks. Some tyres (radials??) are more susceptible than others. Civil engineers are apparently unaware of this problem, and so are city councils and motorists. To help eradicate this problem, refer engineers and councillors to this chapter on the Web. Likewise, all motorists should be made aware of this hidden danger in their driver training. This innocently looking edge between the road and the kerb is the cause of many accidents. It causes drivers to suddenly lose control of their vehicles, which jump onto the kerb, killing innocent pedestrians. In new road constructions, associated with motorways, a more benign kerb is laid, which has a sloping edge. However, even this kerb can be dangerous for some tyres. Obviously, more research needs to be done. Roads are the world's most lethal environments. Just imagine a landscape entirely tar sealed over, for as far as the eye can see. What sort of environment would that create? heat: the heat from the sun would heat the tar-seal close to boiling point, gradually also heating the air to similar temperatures. No earthly creature could live on it, above it or under it. The soils underneath would die forever. adiabatic wind: the hot air would rise unpredictably causing fast uplifting winds that draw in fresh air from outside. The hot air would rise to unmatched heights of over 1000m, interfering with the water cycle. wind: with nothing to slow them down, winds would rage unimpededly at their maximum speeds. runoff: rain water would not be absorbed but run down-hill in ever growing torrents. Clearly, the roads we build are environments from hell, and no matter how small they seem in relation to the total landscape, they do affect the environment and local climate in no uncertain ways. So what could engineers do to compensate? heat: what could be done to ameliorate the heat from roads? by using light coloured rock (or broken concrete) in the tar seal matrix, the road surface becomes lighter, thus absorbing less solar energy. shading trees can be placed on the side facing the sun. It makes an enormous difference. cool marshes and ponds can be incorporated in the road's design, also serving as water traps. wind: the tar seal and road sides will tunnel the wind, so what can be done? sheltering trees of varying heights will slow the wind down. rather than placing trees in continuous rows, they can be placed in alternating rows left and right and in groups. by mixing deciduous trees with non-deciduous ones, there will still be trees with foliage in winter or in the dry season. runoff: roads do not absorb any amount of water, so extra provisions must be made to compensate for this. by including ponds and marshes in road design, runoff can be slowed and even stored for gradual evaporation. 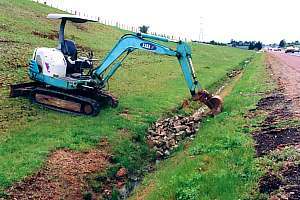 deep ditches with check dams to guide the water to environmentally friendly discharge points taking account of downhill effects. frequent stormwater drains to guide the water under the road to discharge points. Rather than having a few large discharge points, it is better to have many small ones. As stated before, the pressure on roading and housing developments comes from increasing populations and their increasing welfare. So the amount of soil cut and shifted is increasing exponentially, reason why erosion control needs to keep up with this trend. 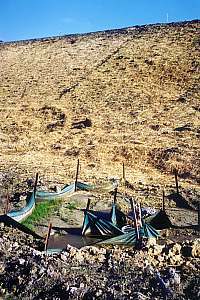 From the chapter on soil erosion follows that the main damage arises from raindrop impact and water scouring. The most effective control of erosion is thus achieved firstly by covering the soil and secondly by trapping running water. Immediately after cutting, the soil must be covered with straw or better still, wood peelings or wood bark, while at the same time re-seeding it. Fertiliser must be applied when seeding and should be maintained by regular dressings, even when the grass is fully grown. Sedimentation ponds at strategic locations, help to trap coarse particles like clumps, crumbs, peds and sand but the finer clay which needs over two weeks to settle out, won't be trapped (see also erosion/rain). Covering the soil and preventing the clay particles from being released, is thus a far better solution. There is never enough room for the pond. Developers want to use all of their land, and a pond is a costly sacrifice and of a 'temporary' nature. Besides, the soil everywhere around it, is being shifted. Ponds are usually much smaller than 5% of the developed area. Even a small rain of 10mm results in a 200-2000mm rise in the pond level, causing it to flow over. Small particles like silt take hours to settle out; clay weeks. These particles, often constituting the bulk of the soil, pass through the ponds. The damaging effects of rain drops increases very rapidly with their size, causing hardly any damage during light rains but massive damage during rainstorms, when the sediment traps are least effective. The water flows too fast and is more turbulent and the ponds are too small to steady the water for long enough. 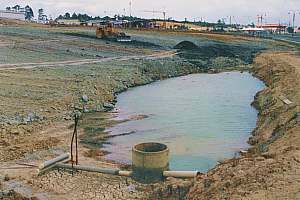 A sedimentation pond has been dug at the bottom of an industrial development site. Its level is low at the moment, caused by underground seepage, but during rainstorms it will flow over into the storm drain in the foreground, from which it flows without further hindrance, into the sea. The area draining into it is about 100 times larger and a 50mm rain storm would raise its level by 5 m! This digger is cobbling a check dam together along the motorway. Check dams slow the water down, to reduce scour. But these dams are placed where water flows slowly already, perhaps intended to trap sediment. Erosion control at the bottom of a hill is always ineffectual. Look at the amount of bare soil on the slope! Here is where erosion control works. A small sediment trap at the foot of a bank covered with straw. Geotextile matting has been placed around the pond as an experiment to see how effectively it traps loose soil. The fact that no soil is found either inside or outside the pond, shows how ineffectual they are. A system of cascading sediment ponds was installed as an experiment to determine their effectiveness. Little benefit can be expected because erosion happens only during extreme events, when runoff grossly exceeds the capacity of these ponds. 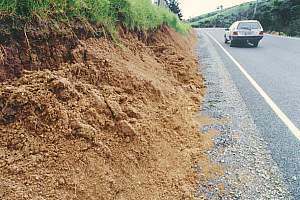 To prevent erosion, road sides need to be stabilised. Natural vegetation is cheapest and most pleasing, while blending in with the natural landscape. In order to provide immediate cover, the bare soil is covered in straw, hay, wood chips or bark while the seed mix is applied. Where banks are steep, paper pulp is used. 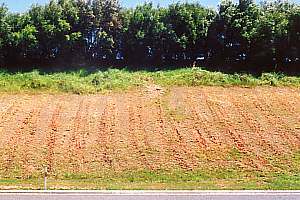 Where banks slope gradually, such as near motorways, they can be grassed over, even grazed for natural maintenance, and motorised grass mowers are able to drive over these banks. The problem here is similar to that of maintaining a pasture. some leguminous plants like clover and alfalfa. some grasses for quick establishment, but it needs to be a mix, including creeping grasses. some fine-leaved, low and slow growing drought-resistant native species capable of being mowed. Ironically, the species most successful for revegetating bare, infertile land, have been declared noxious for this very same reason (gorse, pampas grass, ladder fern). A regrassing machine in action, spraying a mix of water, paper pulp and grass seeds onto the lower bank of a recently upgraded road. Note the bank on right appears several times in the following photographs. This low-key technology consists of a tank with a stirrer inside, and a water pump outside. For each batch, used daily newspapers are shredded into the water-filled tank, and grass seeds are added. Just before being sprayed with drenched paper pulp and grass seed, the bank on the picture at left, looked like this, a very deep, poorly weathered soil, typical of New Zealand's native forests. Only months after application, the grass formed this dense cover, but not for long. Lacking maintenance applications of fertiliser and not surviving the summer droughts, most of the grass died off and was lost. This is the situation two years after regrassing the bank shown above. Lack of ground water and the use of the wrong seeds, caused this regrassing attempt to almost fail completely. Grass did establish lower down, within reach of the ground water. Here the roadside was treated with a ryegrass-clover mix (standard meadow seed), of which only the clover survived, due to its self-fertilisation and resistance to drought. On the slipped patch top right, a new mix has been applied and one can see the young ryegrass coming up. 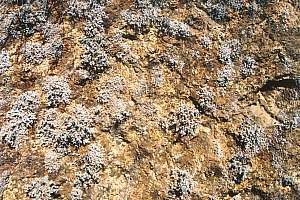 Where rocks are hard enough, and particularly on shaded banks, lichens and hardy mosses develop an attractive and effective cover, requiring no maintenance. Banks underneath a cover of native forests, are much more stable than those without, because the forest retains moisture during summer, also allowing the bank to revegetate successfully. 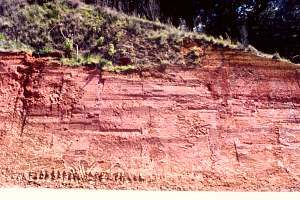 The evenness of moisture over the year, prevents clay from expanding and shrinking, which would break the soil, causing it to crumble and erode and slump. 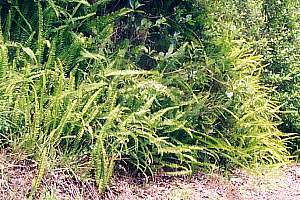 Ladder ferns are stable, drought tolerant ground cover, ideal for road verges but they have recently been declared a noxious weed. The maintenance of road sides is very much a hit and miss affair, lacking clear policy. It was usually done by the staff of the local council, but has recently been contracted out (a freemarket concept). It worsened the condition of the banks, and diminished accountability and responsibility. By now, one can see that maintaining roadsides in a sustainable and environmentally friendly way, is not easy. 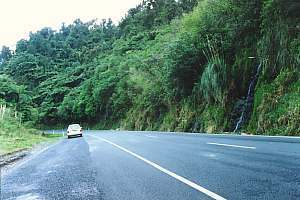 For this reason, the roadside vegetation must be looked at as a fragile environment. being able to see the road's shoulder and ditch, the area for emergency maneuvers. being able to see oncoming traffic around a bend. to prevent roadside fires arising from discarded cigarette butts. scraping by diggers and bulldozers. motorised mowing by cage mowers, flail mowers and slashers. hand mowing by rucksack slashers and weed-eaters. The use of herbicides should be discouraged on banks simply because they lay the ground bare, requiring the vegetation to start all over again each time. It is preferred by councils and contractors because it is easy and cheap and does not need to be repeated as often. However, there is a strong case for outlawing it altogether, mainly because of the erosion it brings about. The use of diggers for weed control on clay road verges is also to be discouraged, but their use on road shoulders (and some ditches) is correct. Mowing the road verges close to the ground can only be tolerated where grassland adjoins and where the bank is robust and fertile. But close shaving prevents hardy and lasting perennials from establishing on the more difficult banks. If we had a nation-wide policy of not mowing closer than 40cm to the ground, such shrubs and ferns could establish themselves. It would require far less maintenance, produce less erosion, while offering a pretty, bushy look of our road sides. Many roads in poor countries are still unsealed, providing a major source of mud. 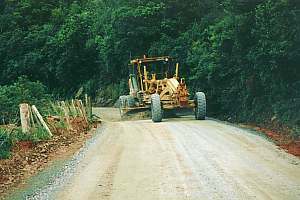 In this picture a grader is seen grading a gravel road on a clay base. A grader works like a wood planer, cutting the surface between the front and rear wheels, thus levelling any unevenness. It requires skill. As long as the road remains covered in gravel, raindrops will have little effect. This bank was once perfectly vegetated but tractor-mounted slashers have damaged it severely in an attempt to shave closely. With contractors in charge, and council staff not checking the work, the environment is left at their mercy. This bank is maintained by spraying with herbicides. It bares the soil, which allows rain drops to carve it out. Herbicides are tolerable on the gravel road shoulder but not on clay. 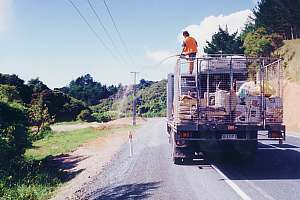 In the hands of poorly instructed workers, roadside weed control can inflict serious damage to this fragile environment. 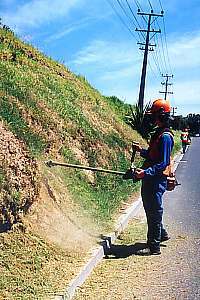 Here a worker uses a motorised weed-eater to trim the grass, but the soil is bared and slashed in many places. 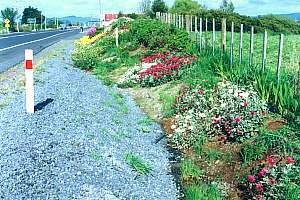 A growing number of people are taking stewardship of sections of roadside, revegetating them in attractive ways, often with robust perennial flowering plants. Passers-by are now enjoying their initiatives and efforts. 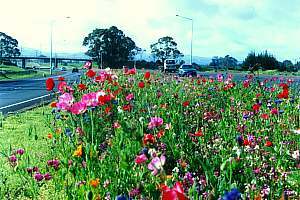 The median strip of this motorway has been sown with wildflowers. Their gaudy colours provide a most welcome change of the monotony of the motorway. Once sufficiently tall, they also shield the traffic from oncoming headlights. A stretch of roadside is maintained by the local landowners, who planted these attractive perennial flowers. County contractors are often too bloody-minded in their grass mowing, which has caused some clashes. Improved engineering: including the ditches and revegetation in the road design. 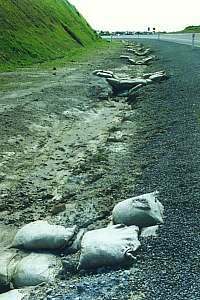 Shifting priorities: national roading agencies should shift funding priorities toward the sealing of unsealed roads. Taking responsibility: local councils should take full supervision and responsibility. Protecting bare land: by covering it, with whatever means. No amount of bare land is acceptable. More research: into improved vegetation and seed mixes, improved kerb profiles for sunlit and shaded margins. Improved management: by not spraying on clay, mowing only to 40cm off the ground. Education: educating engineers, local councils, motorists, the public. Blowing whistles: don't accept bare soil or shoddy practices anywhere. Report unsatisfactory situations. Form care groups: form a care group to take care of sections of road.